The provider of this webpage is the Weierstrass Institute for Applied Analysis and Stochastics, Leibniz Institute in Forschungsverbund Berlin e. V.
It is the policy of the Weierstrass Institute for Applied Analysis and Stochastics, Leibniz Institute in Forschungsverbund Berlin e. V. (in the following WIAS) to ensure that personal data be protected from misuse. Only personal data are recorded which are necessary for the fulfilment of the tasks at hand. 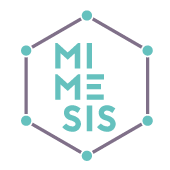 It is generally possible to visit the websites https://www.mimesis-eid.eu without informing us of who you are. We are only informed about standard data recorded by the web-server (logfiles). This information is evaluated for statistical purposes. There will be no further use of data. When you provide us with your personal data, you are granting us the right to use these data for the fulfilment of the services and procedures you have chosen. This consent can be rescinded at any time. In order to provide you with the best information possible you will find links on our pages that refer to the pages of third parties. Insofar as such links are not self-evident, we expressly point out that this is an external link. The FVB does not have any influence whatsoever on the content or design of these third-party pages. For this reason the guarantees provided by this data protection declaration do not apply to such pages. This also applies for individual scientific institutes of the Forschungsverbund Berlin e.V. that may have chosen to adopt a different approach for their respective websites. Different rules may apply to certain services on our site and are explained below. On our website we offer you the opportunity to contact us by email or by using a contact form. In such event, information provided by the user is stored for the purpose of facilitating communications with the user. No data is transferred to third parties. Nor is any of this information matched to any information that may be collected by other components of our website. In order to protect contact forms on our site, we use the “reCAPTCHA” service of Google Inc., 1600 Amphitheatre Parkway, Mountain View, CA 94043 USA, hereinafter “Google.” By means of this service it can be distinguished whether the corresponding input is of human origin or is created improperly by automated machine processing.